When you have made the investment in a recreational vehicle, it’s important to ensure that it is properly protected with the right RV storage solution. Many owners may be put off by the steep costs of RV storage facilities, which charge a monthly fee for holding your vehicle, but also make it inconvenient should you like to access your RV. But these facilities aren’t the only option available for those who want to ensure their RV is stored safely; steel buildings are quickly becoming a favoured method of RV storage, for the below reasons. Choosing a steel building for RV storage helps keep your RV protected from the elements, ensuring longevity and shelter from harsh weather conditions. Typically, an RV that is left out on driveways throughout the winter is more susceptible to rusting, corrosion and other wear and tear. Furthermore, even leaving your RV exposed to the sun for long periods of time can cause damage, gradually wrecking the finish and breaking down the seals. Because steel buildings are designed to withstand all weather conditions, these common issues no longer present a problem to RV owners. Unlike RV storage facilities, which charge monthly fees for storing your recreational vehicle, a steel building is a long-term, one-time RV storage solution. Investing in a steel building up front provides you with a structure that will house your RV for decades, as they are strong, rust-proof and maintenance free. 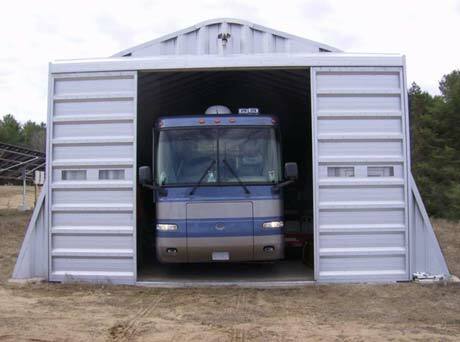 They also provide a much more convenient RV storage solution, as your vehicle will be kept safely in the confines of your own property, not off site. A steel building is a customizable structure, allowing you to choose the size and design that best suits your RV storage needs. Regardless of the size of your RV, there is always an option that perfectly capacitates it. Furthermore, unlike RV storage facilities, your steel building doesn’t have to be used exclusively for storing your vehicle. You have the ability to add loft space or other additional storage areas, meaning you can also solve other storage issues with one structure. Storing your RV on your own property provides you peace of mind, knowing that your investment is securely located and housed in close proximity. And because steel buildings are strong and built with security in mind, you can rest assured knowing that your RV is safe even when you’re not at home. If you’re looking for an RV storage option, but don’t want all the inconvenience that comes with renting space in a storage facility, a steel building may be the perfect choice for you!